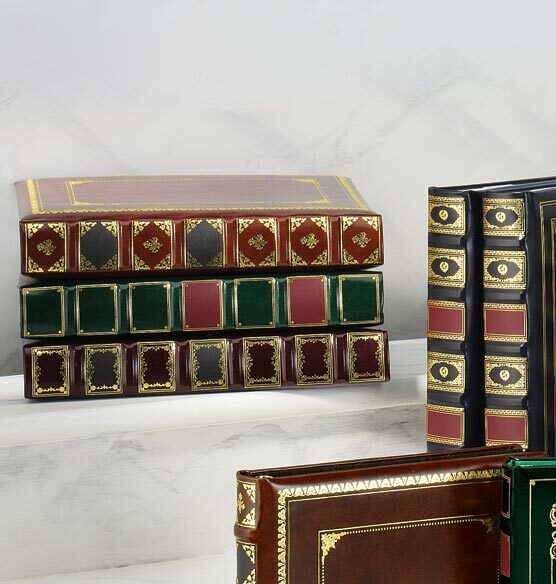 This top-grain Library leather personalized photo album features ornate, beautiful gold tooling on its cover and spine. 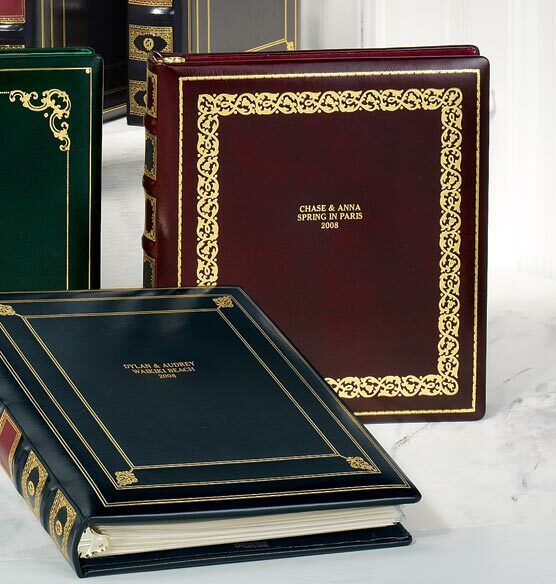 Ornate tooling designs give each album a timeless, vintage appearance that stands out from other styles. 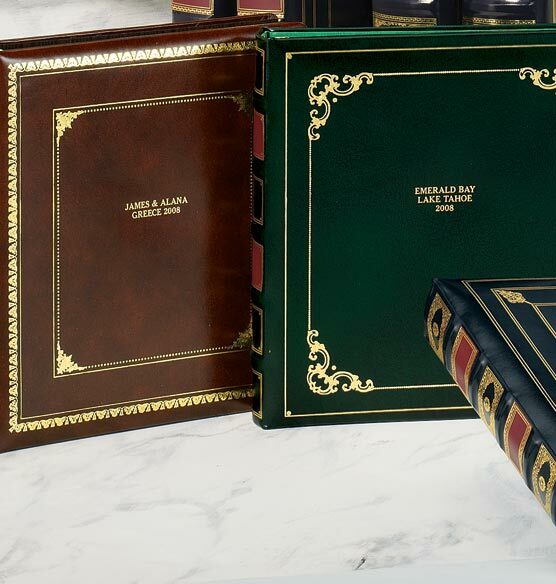 There are four classic color choices, including brown, burgundy, hunter green and navy, and each of the four colors features a distinct tooling pattern, created by hand, on the cover and repeated down the spine. 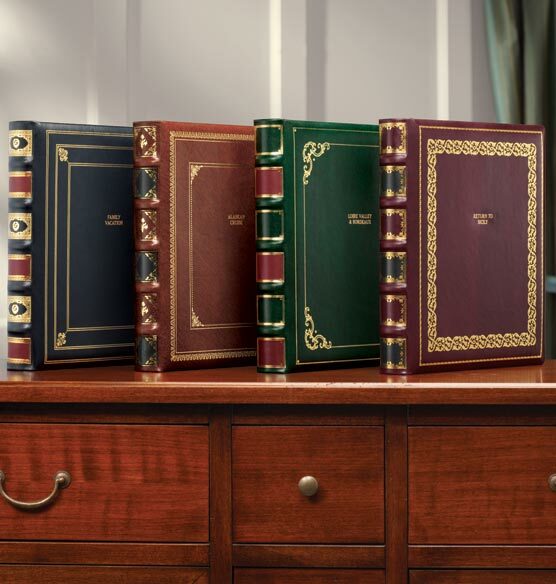 Spine colors and detailing helps add to the illusion of a vintage book of great value. On the front, you can add up to 3 lines of original text for customization. 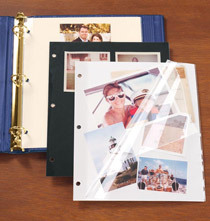 This luxurious album comes with three binder rings, and it easily holds 3 to 4 sets of photo pages. NoPers is not available at this time. Only the best will do for my library. My personal library is known world-wide. I require the best materials to display my treasures. Exposures leather products are right there as visitors' jaws drop. This is a fantastic product but the personalization all depends on who is behind it. I've had off center, crooked personalization or letters filled in with stencil (think o, e) that I have had to use a pin to remove. While I miss-spelled a word, this should have been picked up by quality control and wasn't. Poor quality compared to photo albums I have purchased in the past. Very disappointed but I guess I can't expect much from a product made in China. This album will hold ten years of my favorite photo selected for each month of the year and displayed in one of the twelve months of the year frames. I have been putting each new photo on top of the others in each frame, but with so many photos now, the frame backing no longer fits. So from now on, I'll put the pictures in this album with appropriate captions. How many pages will this album hold? BEST ANSWER: It appears that it can hold up to 40 8x10 photo pages, but it is a little slimmer than the Antico photo albums. 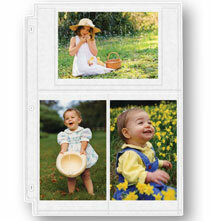 However, there is still plenty of room for more than 40 pages in my Antico albums, so I would think 40 will fit fine. I have both. 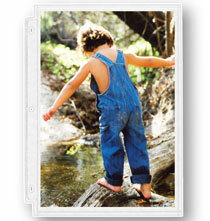 If you mean paper, it can hold at least 100 pages, but the hinges are not as strong as they used to be. Thank you for your question. To fill it to the max it can hold 40 pages. We hope this information will be of help to you. Would it be possible to go up add two more letters to personalization which would take it up to 22 characters? BEST ANSWER: Thank you for your question. Unfortunately the personalization can only have 20 characters. We apologize for any inconvenience. Can the spine be the same color as the cover rather than two color? BEST ANSWER: Thank you for your question. Unfortunately, the albums only come as pictured. We hope this information will be of help to you. What do the pages look like inside? BEST ANSWER: Thank you for your question. This album, does not come with pages. You choose the page you want for the album. Page selection will pop up after adding to cart. We hope this information will be of help to you. How many pages will it hold? I love these albums and use them for trips and a year of best photos. 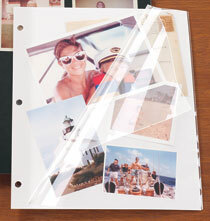 it is a loose leaf album that allows me to choose my own pages.